I had high expectations for my first visit to the Malvern Spring Show, and I was not disappointed. A number of my online gardening circle had sung high praise of this garden show including it's magnificent setting. I went to the show with my sister who had the pleasure of chauffeuring me and my wheelchair about. We arrived around 10am, the weather was perfect the sun was out with the odd breeze to ensure we were not too warm. 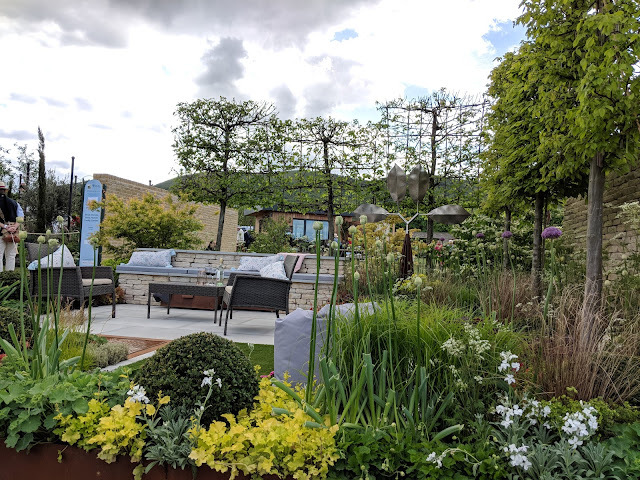 Show Gardens - It was a pleasure browsing around the show gardens. My favourite was the Perfumer's Garden, which incidentally worn the Best Show Garden. The Spirit of the Woods garden had a real calming feel about it, with few people around us we could almost feel a soothing sensation wash over us. It is a great opportunity to talk to the designer and most gardens were handing out plant lists, which comes in very handy as the gardens are a great source of inspiration. 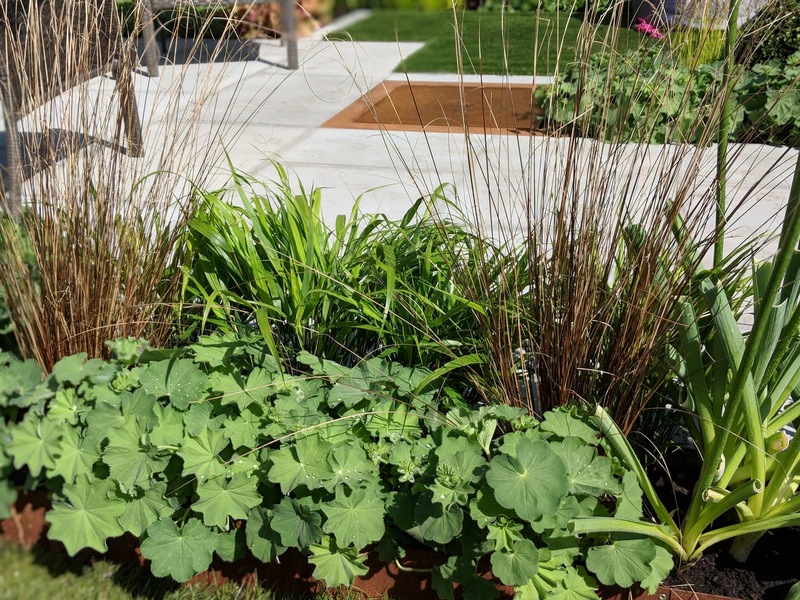 The smaller Green Living Spaces garden offered some practical and imaginative planting ideas. Having thought about it since my visit I think these were of more interest to me. I thought there a good choice of plant stalls, though unfortunately we did not manage to find one with a good selection of grasses. 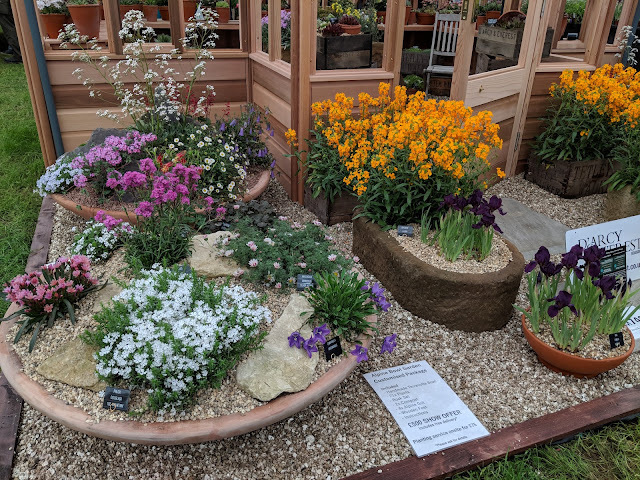 But having spoken to a few people at the show I was told more than once that the show was much smaller, and there were less choice of plant stalls. Obviously as a first time visitor I didn't notice. There were numerous traders selling greenhouses, they were selling a lifestyle not just a greenhouse. They were beautiful, set up and styled to lure you in. If I was in the market to replace my greenhouse, I would certainly wait to visit a garden show - so much choice in one location. Both my sister and I were very impressed with the Guild of Crafts area, the choice and quality of products made was exceptional and a real pleasure to look around, and one I would recommend. We found time to enjoy the Green Kitchen talk at the Grow & Cook Theatre with Alys Fowlers, Martin Fish and Mark Diacono. 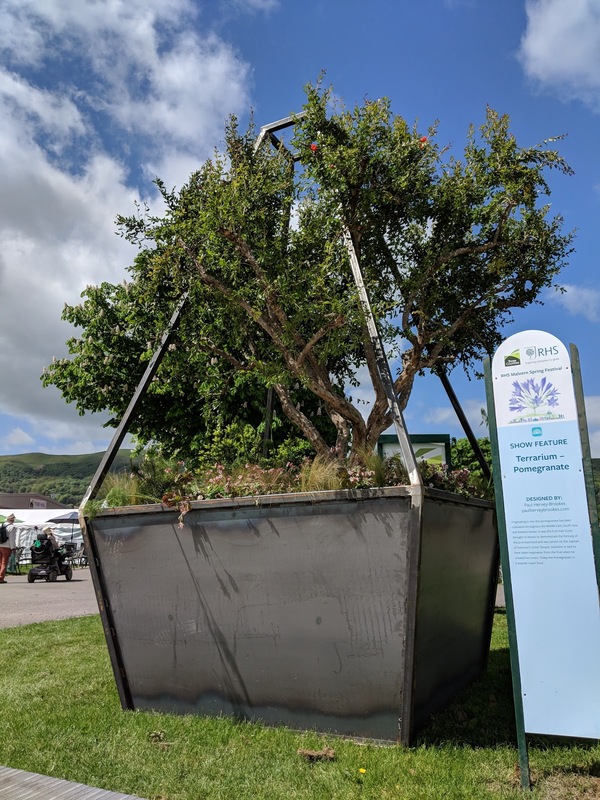 Though we forgot Gardeners Question Time at the Festival Theatre and only managed to catch some of it, we were so engrossed with looking at plants! I was particularly keen to see The Work of Heart Garden, a knitted and crocheted garden. Created by Clare Young whose late husband was cared for by Sue Ryder Leckhampton Court Hospice. 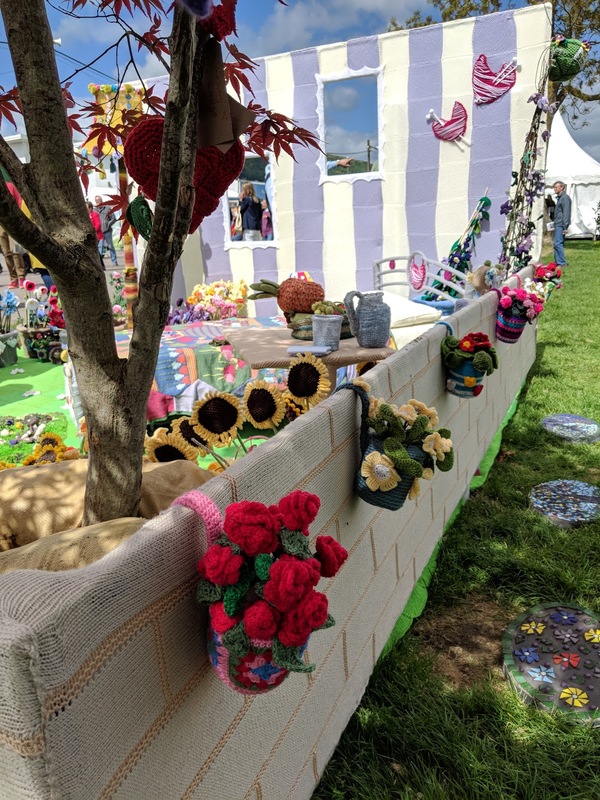 Crafters from all over the world including myself have crocheted and knitted a staggering 50,000 hearts to help raise money for the hospice. 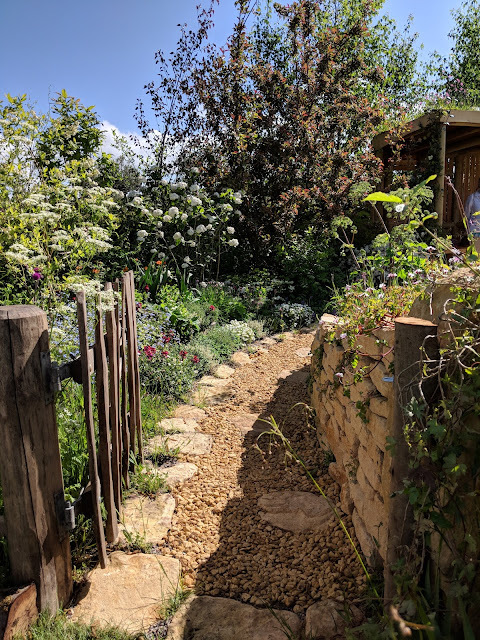 Well done to Clare for creating this amazing garden. The busiest spot at the show was the Floral marquee. This was no surprise it must be the most popular area of the show, so many flowers perfectly presented plus the opportunity to buy. 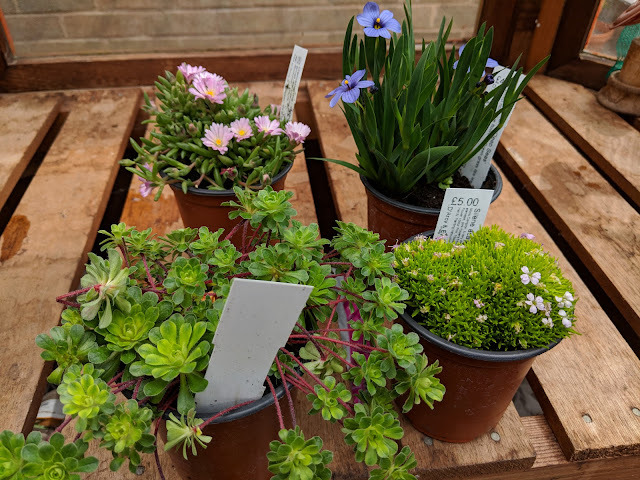 We certainly did, tempted by the display and choice of alpine plants at the D'arcy & Everest stand. We spent just under £20, unlike the person next to us who wanted reserve one of the £500 display gardens! 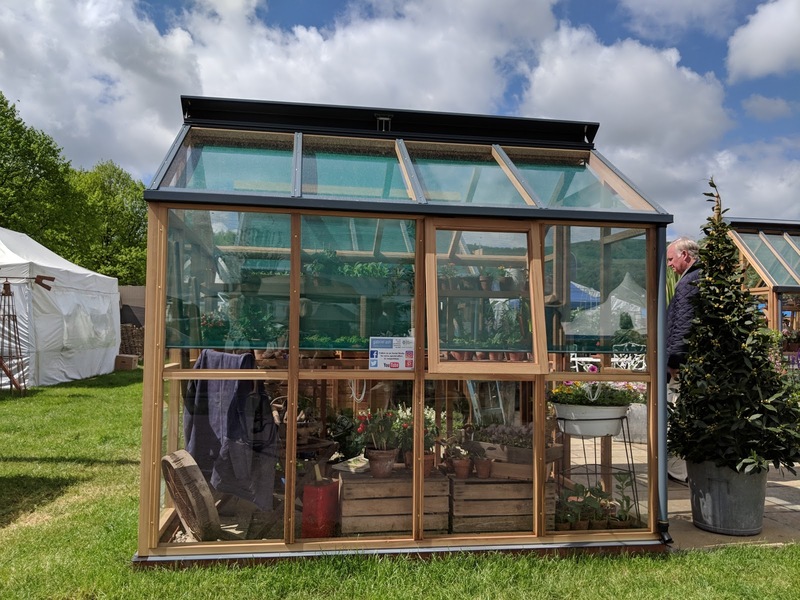 Also within the Floral marquee you will find the RHS Gardening Advice stand, we waited very briefly to talk to an expert about our poorly Laburnum and the ants in my vegetable raised beds. There was plenty of space to move around The Great Pavilion of Art and Flowers, and some impressive flower displays along with floral arrangement demonstrations. It is worth buying a show guide (£5). 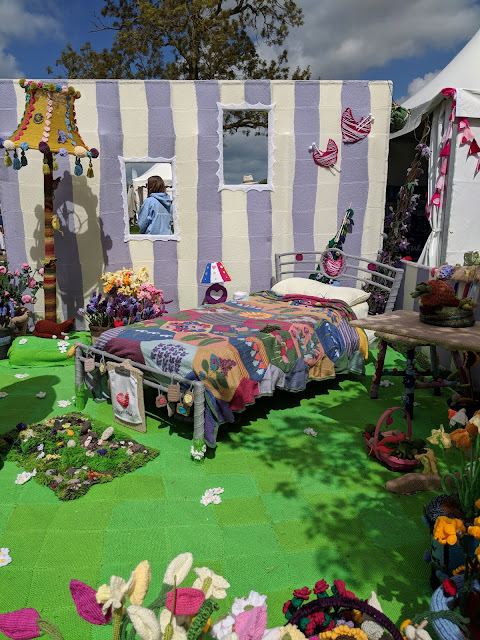 Have a look around the show gardens or the floral marquee then grab a drink and plan your day. It contains all the listings for the various theatres, I found I was constantly referring to the show map throughout the day. 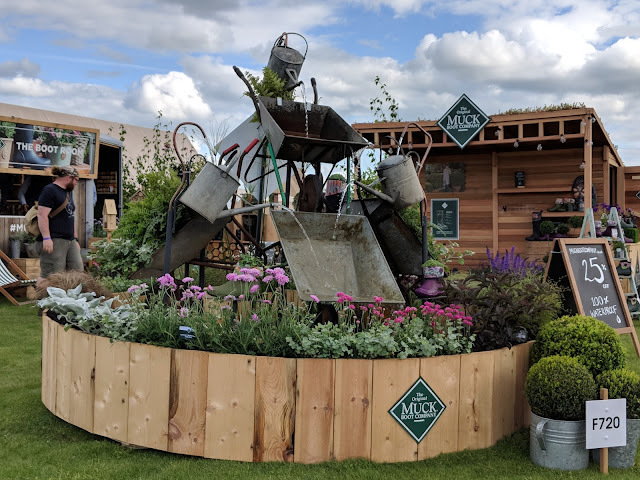 Monty Don was not at the show but this greenhouse looks staged to appear like he had popped out and left his jacket behind. You are sure to spot a gardening or foodie celebrity during the day; I was convinced that Carol Klein was stalking me at one point! You will find a good choice of food and refreshments (although you can bring your own), the only queue I saw was mid morning for coffee, but move on around a corner and you will find another vendor with no queue. Again we easily found seats. The vintage tea corner in the Arts and Crafts area served nice tea and coffee and plenty of space between tables but very disappointing cakes. Next to the Festival Theatre near the show gardens you will find a number of street food stalls including tempura, gourmet burgers, churros and pasta. The Avon Hall is also another good location to find a selection food stalls. 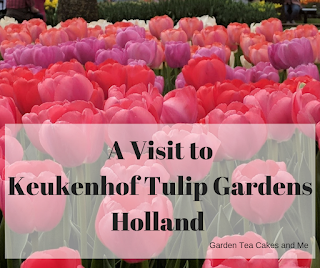 Thursday is the day to go, it was not overcrowded and a pleasure to move around, no queues for looking at the show gardens, food or toilets. The floral marquee was very busy but I had expected that it is one of the highlights of the day. Though Thursday is the more expensive day, it was very enjoyable and if I go again it will certainly be a Thursday. 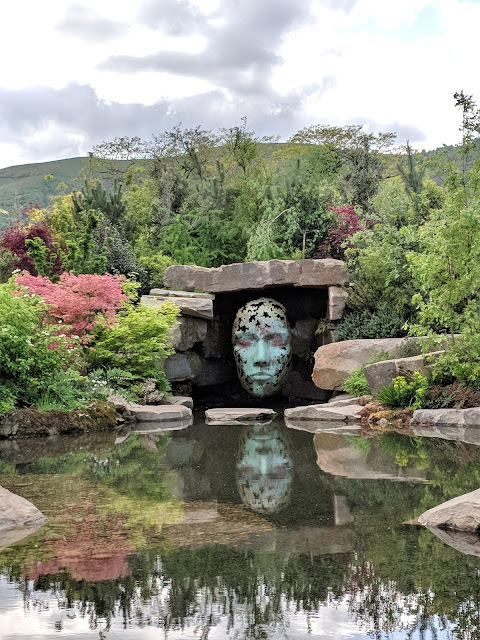 The Malvern Hills made for a phenomenal back drop to not just the show gardens but the whole event. Giving it a very different feel to the event, relaxed and surrounded by nature. 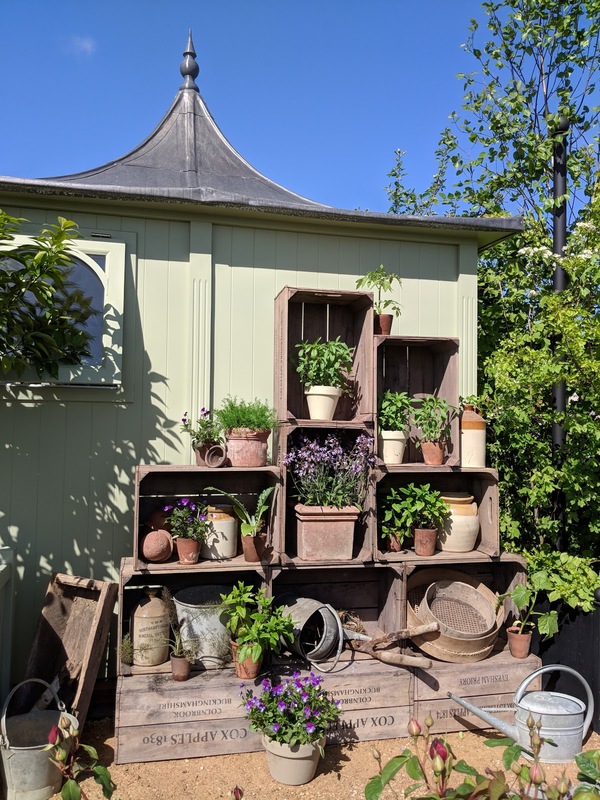 Many years ago I visited RHS Hampton Court, I remember nothing about it except the serious overcrowding, being a shorty it was no fun. 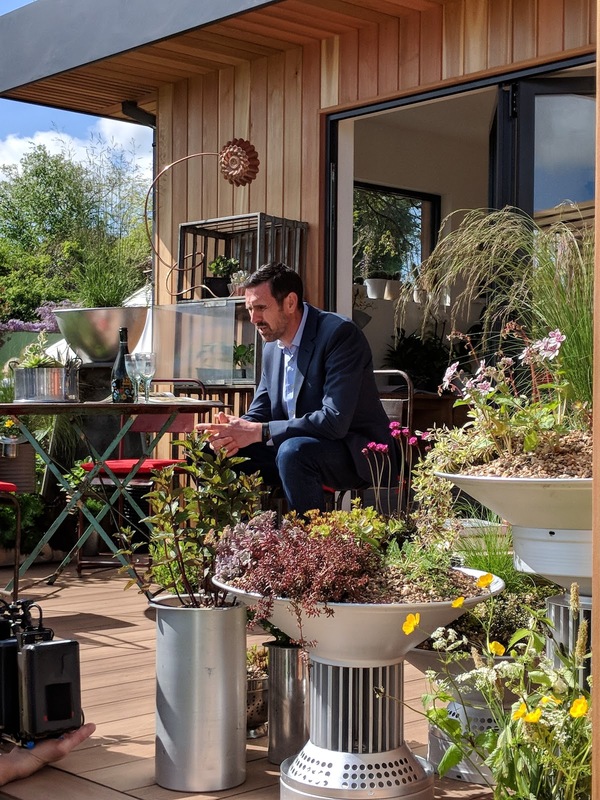 Gardeners World Live, Birmingham is only 40 minutes away from where I live, but you are either surrounded by buildings or inside them. Next on my garden show wish list is The Shrewsbury Flower Show, a very local show for me as it is located in my home county. 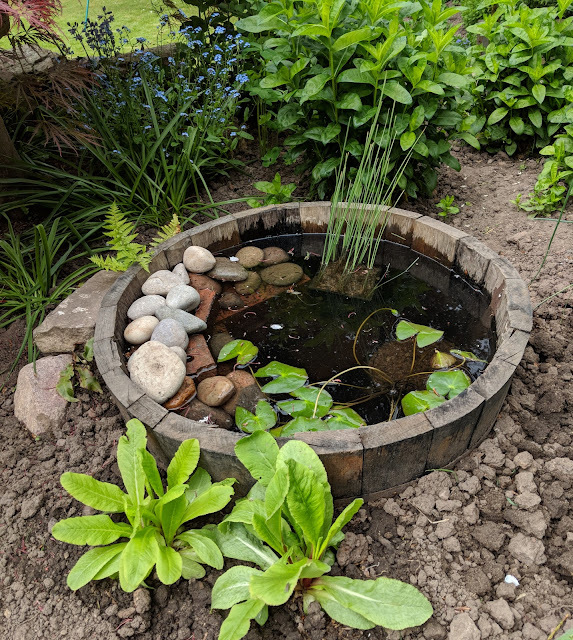 A water lily 'Nymphaea Pygmaea Alba' and miniature bullrush 'Typha minima' plant purchased from Dorset Water Lily Company have already been added into the water feature, which is still an on going project. 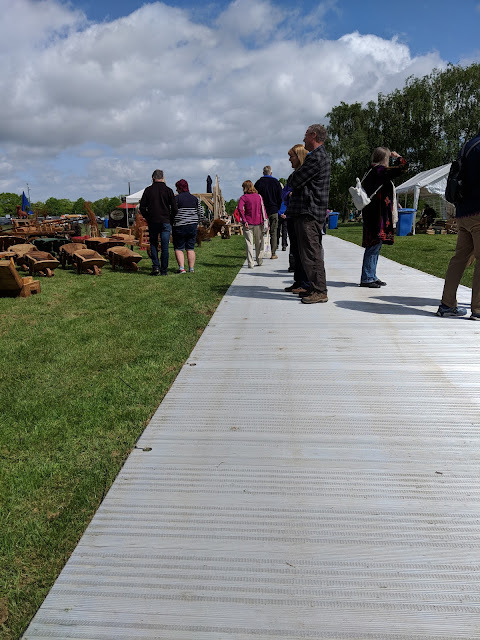 As the show is based at the permanent site of the 3 counties show grounds there are a large number of permanent paths and buildings which makes the use of a wheelchair or scooter easy. The more rigid temporary paths were also very good. Inside many of the marquees are also worn down grass and were reasonably good. Sturdy temporary paths at the show made moving around with a wheelchair easy. Moving around the main show ground field was very uneven, but as the weather had been dry was not muddy or unnavigable. As I am not confined to a wheelchair I chose to walk this area, as sitting in the wheelchair was very bumpy on my spine. I suspect if you where in a scooter this would not have been as bad as my manual wheelchair. I am going to give a big shout out for the guys at the Event Mobility stand that hire out scooters and wheelchairs for the event. Half way through the show my wheelchair encountered a problem with one the brakes jamming, and they very kindly repaired it for me. The disabled car park was situated at the west entrance, which brings you in at the Show Gardens. Once parked the initial ground is very uneven, fortunately we were just a few cars away from the more even pathway leading towards the entrance. It may be worth mentioning to a marshall if you need to park towards the end of the row. There are plenty of toilets situated around within the show ground and at the car park, including disabled access toilets. These are clearly marked on the show map. Approaching Malvern from the north west we had to make our way around Worcester, with major road works and heavy traffic this part of our journey alone took us an hour. Leaving the show at 5pm we encountered additional traffic as the first horse racing of the year at Worcester race course had just finished. Expect delays and embrace them! We ensured a number of sweet treats purchased at the show to reward ourselves during delays on the journey home. 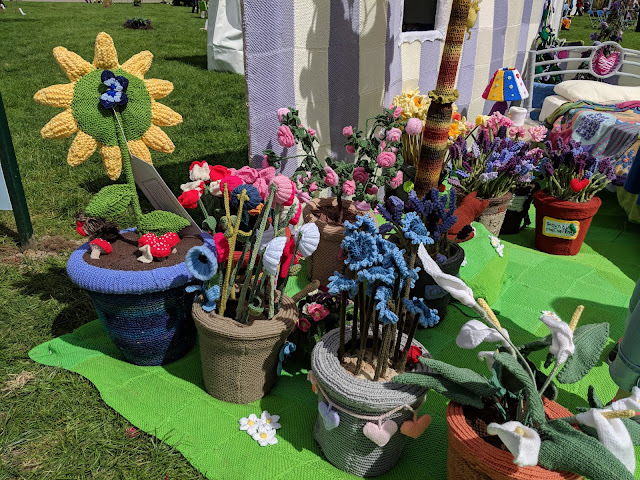 I could go on and on about just how much I enjoyed the Malvern Spring Show, so much space to more around, a wide variety of gardens and food demonstrations to see, plenty of retail stalls too. But don't just listen to me, start planning your own visit. Do you have any garden show recommendations? 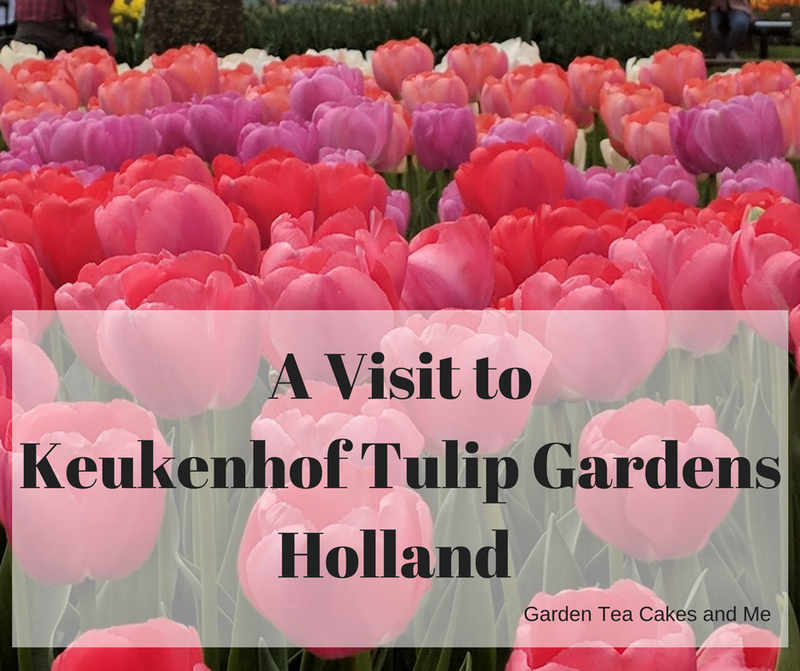 Explore Keukenhof Tulips Gardens with my visitors guide including tips and getting the most out of a visit and accessibility advice. You took us on an amazing tour, it was a delight to admire some of the wonderful displays. Thank you for sharing such a great event. Thanks for your great feedback Ange. Sounds like it might be worth me giving it a go, probably on a Thursday as you suggest. A smaller show might work for me better too, because I can only take in so much, as I have a chronic illness that limits mobility and energy. I too enjoy seeing the D'arcy & Everest stand at shows - always hard to resist. I like the display of those boxes in the perfumers garden. Your photos certainly tempt me to try visiting next year!